Tomboy Rd, a somewhat rough 4WD route, climbs out of Telluride to the east, past the Tomboy Mine ruins and up to Imogene Pass at over 13,000ft, before dropping down the other side of the crest into Ouray. I had been looking forward to driving this road since I had gotten the Jeep and suggested the three of us go up there on our first full day in Telluride. There are plenty of summits around the pass, some of which I had climbed on previous visits with long hikes from the highway. Starting at 13,000ft makes things considerably easier and I was happy to take advantage of this. Leaving Telluride at 7a, it would take us well over an hour to make our way up Tomboy, but the early start meant we had the normally busy road to ourselves - seems few of the 4x4 crowd gets up and moving at that time of morning. We parked at the lookout point on the east side of the pass, halfway between Telluride Peak and T7. 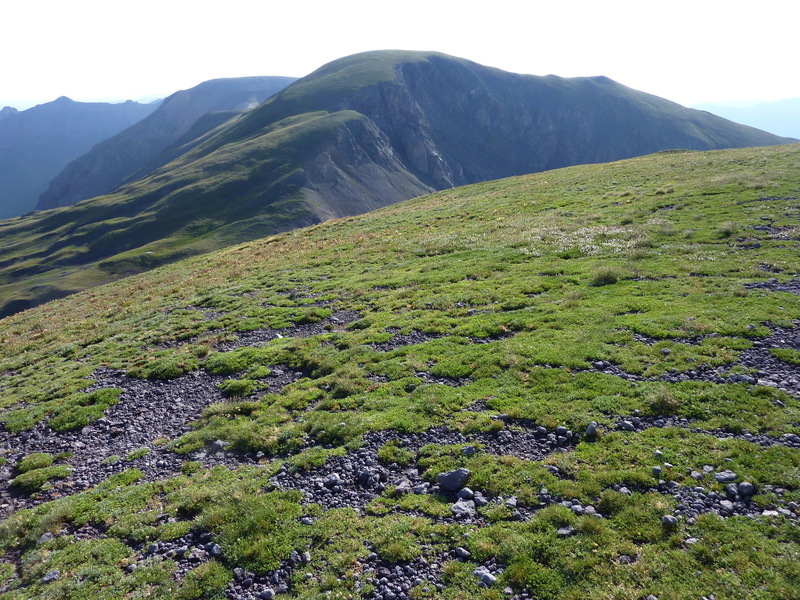 It was a beautiful morning, not a cloud in the sky, with fine temperatures for strolling about the hills at 13,000ft. My plan for the day was to hike three or four summits on the crest between Imogene Creek to the west and US550 to the east. Eric and Steve would join me for the first peak, then head back to do Telluride Peak, a summit I'd done previously that Eric was keen on. T7 is located about half a mile northeast of the lookout, requiring one to first drop about 300ft to a saddle before climbing 450ft up the southwest side to the summit, along the green alpine ridgeline. The easy class 1 hike took less than half an hour. While waiting for the others to arrive, I walked out to a lower point to the southeast to see if I could get better views into the drainage in that direction (not appreciably so, it turns out). Eric and Steve wandered up to the flattish summit less than ten minutes later. We had a small discussion about what looked like a tricky ridgeline to T8 as one continues another 3/4mi to the northeast. I wasn't much concerned since I knew others had done this ridge traverse, but my companions thought it might be trouble. They watched me for half an hour from T7 as I made my way down along the ridge, popping around one pinnacle or another, eventually emerging at the saddle on the other side of the difficulties in about half an hour. Satisfied that I hadn't gotten myself killed, they returned back towards the car while I carried on up the SW Slopes of T8 to the summit in another 15min. This, too, had a flattish summit, with the addition of a register, left by Mike Garratt in 2007. The third summit, Hayden Mtn South, would be a little more work, another mile and a quarter to the northeast. A little more involved, the traverse between these two would take the better part of an hour. I continued on the ridge only a short distance before dropping off the north side into upper Richmond Basin to avoid the longer route along the ridge. There is a 4WD road rising up into Richmond Basin from the Camp Bird Rd below, part of which I hiked along. This road could be driven to reach South Hayden and North Hayden more easily than from Imogene Pass. I picked up a good use trail just below Richmond Pass that would take me the last half mile to the summit, mostly on the west side of South Hayden's South Ridge. Now 10:40a, I decided Hayden North was going to be a bit more work than I had time for, leaving it for another time. Rather than head back along the ridgeline I had followed, I chose to drop off the west side of Hayden South towards Upper Camp Bird where I could pick up the 4WD road back to Imogene Pass. I went down steep talus/grass slopes for 1,000ft to reach Richmond Basin. Here, I landed again on the 4WD road mentioned earlier, following it down the basin. I found a combination of old road and use trails that allowed me to contour west above Upper Camp Bird, saving me from losing an additional 600ft or so. The use trail I followed nicely came out at a campsite just off the 4WD road I was looking for. Nearing noon, it was high traffic time for the off-road crowd and I found dozens of vehicles making their way up to Imogene Pass. A few paused to offer me a ride, but I declined, finding the hike refreshing and not really much slower than the vehicles that had to wait periodically for others ahead of them. Upon reaching upper Imogene Basin, I left the road for the last 3/4mi as I made my way more directly back up to the lookout point. The place was busy with other vehicles when I returned just before 12:30p, folks taking in the views, walking up to the nearby point to the southwest and stretching their legs.